So which provinces has the most number of properties for sale? 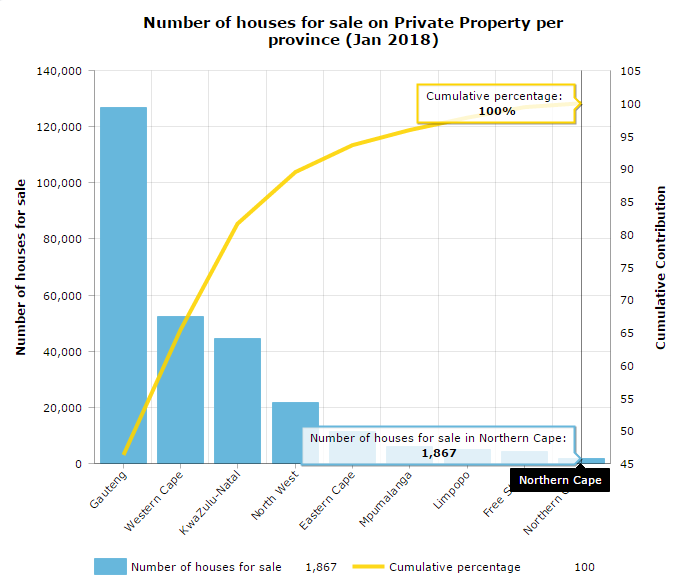 The graphic below shows the number of properties for sale in each province as well as provide the cumulative contribution as the number of properties of the next province is added to that of the previous province. The graphic above shows that Gauteng has by far the most number of properties for sale, with it making up 46.3% of all properties for sale in South Africa. Almost 127 000 properties are currently listed as for sale on Private Properties website. The next biggest contributor to number of properties for sale in South Africa is the Western Cape, with almost 52 300 properties for sale (thats roughly 20% of all available properties for sale in South Africa). Combined Guateng and the Western Cape makes up around 65.4% of all properties for sale in South Africa as listed on Private Properties website. Coming in in third position is the province of KwaZulu-Natal, with almost 44 500 properties for sale (which equates to roughly 16.2%) of all properties for sale in South Africa. Gauteng, Western Cape and KwaZulu-Natal accounts for almost 82% of all properties for sale in South Africa currently. In total there are 273 986 properties currently listed as for sale on private properties website. As mentioned we will update these numbers once a month and start building a time series of properties for sale and see how the supply of properties affects the price growth of properties in the provinces, as measured by various property indices in South Africa.